Today’s episode is all about learning how to convert a school bus into a tiny home, figuring out if buslife is right for you, and avoiding the common mistakes of school bus conversions. When I went to the Georgia Tiny House Festival in the spring of 2017, I was blown away by all the school bus conversions, or skoolies as they’re known. But there was one bus that really impressed me with its beautiful yet simple aesthetics and thoughtful owner, Michael Fuehrer of Navigation Nowhere. Since finishing his bus, Michael has been living on the road and helping out on many other school builds along the way. 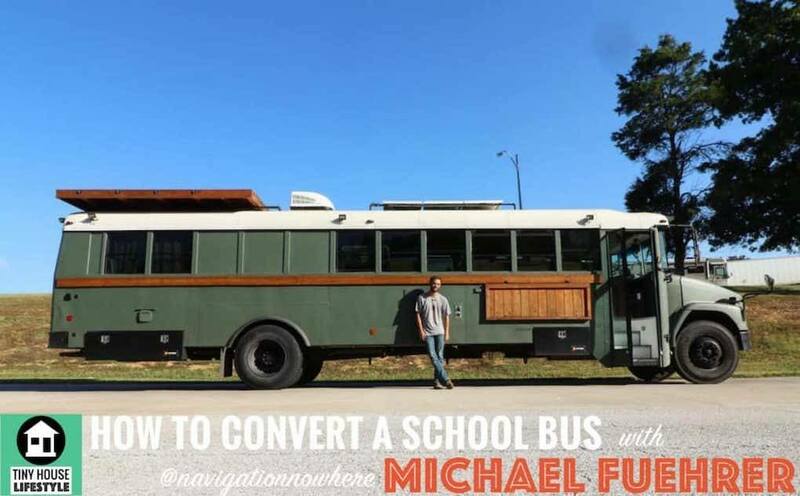 I asked him on the show to give us a primer on skoolie life, from deciding whether it’s right for you, to choosing the right bus, and avoiding common conversion mistakes. School bus tiny homes present some unique challenges and Michael has his share of experience. Michael shares so many amazing tips on bus building from insulating properly, to mechanical considerations.